The intense and unique taste of wild raspberries has almost been forgotten - it's time to rediscover that taste. The wild forest raspberries that we use for our star are still picked, collected and sorted out by hand, and then further processed gently. 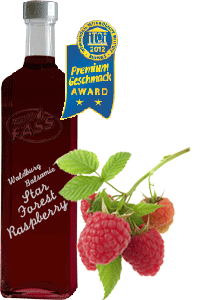 The wild raspberry vinegar is refined with natural wild raspberry juice concentrate - a rarity in the aroma and an unforgettable taste experience. Just a star! The wild raspberry Balsam Star gives desserts or meat dishes a special touch and is also suitable as a basis for alcohol-free aperitifs and digestifs.